This past weekend Jeff set out to make some Man Food for the Super Bowl. Jeff loves wings. He loves mole sauce. He decided to combine the two. So this weekend he commandeered the kitchen and started cooking. This tasty little bit was the result. While not spicy, it’s become my new favorite wing recipe. Very flavorful. The kids loved it. If you want it spicy, add cayenne or chili powder to the sauce to taste. Stay tuned for more Super Bowl recipes this week. In a heavy skillet, sauté the onion in the coconut oil over moderately high heat, stirring occasionally until it is golden brown. In a mortar, use a pestle to crush the coriander seeds and anise seed, stirring them into the onion mixture with the chili powder, cumin, rapadura, and cinnamon, and cook the mixture over moderate heat, continuously stirring for 1 minute. Stir in the cocoa powder, peanut butter, 2¼ cups of chicken broth, tomato paste, cranberries, garlic paste, and salt to taste. Simmer the sauce, uncovered, stirring almost constantly, for 20 minutes or to desired consistency. Once the sauce is cooked, remove from the heat. While the sauce is cooking, prep the wings by clipping the tips and give them a quick rinse. Pat the wings dry; season them with salt and pepper. Place the wings on a greased cookie sheet or on a silpat on a lipped cookie sheet and place in the preheated oven for 20 minutes. Drain the pan. In a blender or food processor, purée the sauce, adding additional broth to thin it to the desired consistency, if needed. We liked ours thick. Pour three quarters of the sauce into a large bowl, add the wings and toss for a full coating. 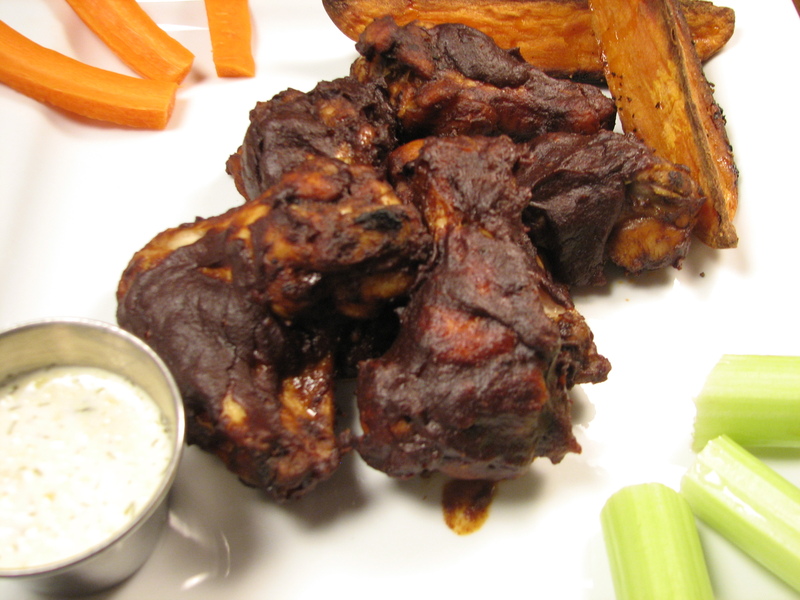 Place a cooling rack or broiler rack on top of your sheet pan and place your coated wings on top. Cook for the 30 minutes or until done. Serve while hot. Mmm . . . this looks good! I just have to tell you that my husband and I made a batch of these yesterday and they were a hit! We made a couple changes, using up some chipotle peppers instead of the chili powder, and molasses instead of rapadura, but the inspiration was all you. They were so good that my husband actually won the best food contest at the party he took them too. I went to a different friend’s house and she was all about the layers of flavors in the sauce. I’m so glad I found this recipe, thank you! Cara recently posted..Mushroom Pesto Pinwheels (Gluten Free, Dairy Free) for Amy’s Baby Shower!